Three phase converters, from Phase Changer , change a 240V or 480V single phase supply into an equivalent 415V three phase output, which will efficiently operate any three phase equipment. The 415V three phase output is just like a utility three phase supply. It allows users with single phase supplies to run three phase motors, which cost less, provide more power and require less maintenance. Three phase motors also run more efficiently, quieter and more smoothly than those using single phase power. 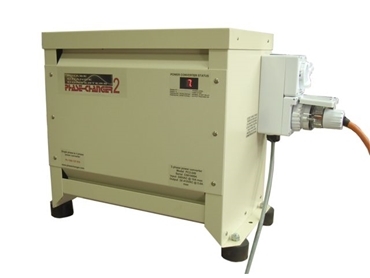 The cost of connecting directly to a three phase utility power supply can be expensive, especially when compared to the cost of a three phase converter from Phase Changer. Once purchased, at a competitive price, the three phase converter becomes the buyers property meaning it can be relocated or sold if circumstances change. Three phase converters are based on a rotary converter technique, with improvements. By using the best current micro-controller technology available, Phase Changer have dramatically enhanced the performance of the rotary converter. By continually monitoring the output of the converter, the micro-controller controls the value of the capacitors required for "ideal tracking". Using high voltage industrial solid state switches called thyristors, capacitor banks are switched in and out quickly and silently as determined by the micro-controller in 9 distinct levels. All switching is done with precision while the AC sine wave is at zero volt potential, ensuring there is no stress to either the capacitors or to the thyristors themselves.